Environmentalists, wildlife activists and animal welfare organisations are pressing the new government to pass an animal welfare bill to put an end to animal cruelty in pet shops. 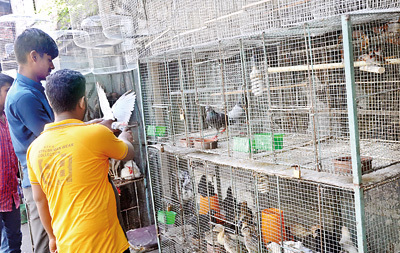 A high-ranking official of the Colombo Municipal Council (CMC) told the Sunday Times that none of the pet shops in Colombo had a licence to operate because their owners provided little or no care for the animal and birds kept for sale. In a well-known pet shop on the Kandy Road we found labrador pups and dachshunds only six weeks old placed in steel mesh cages measuring 2 x 2 x 3 feet stacked vertically so that the animals were urinating on each other. The puppies were playing on urine-soaked bedding. 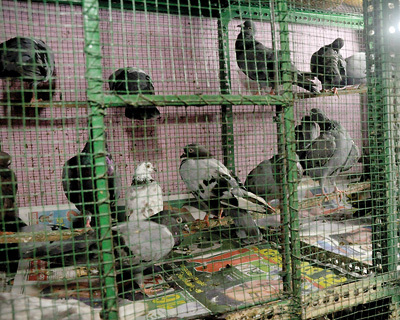 In the Kosgashandiya area are a row of shops, each only about 10 feet square, crowded with cages full of budgerigars, African love birds, cockatiels, java sparrows and local pigeons. Here, too, the cages are stacked on top of each other. The birds were traumatised and in fear. The shop was dark and damp and the floor was covered with feathers and bird droppings. There was an unpleasant stench. In one shop we saw 10 pairs of java sparrows in a 1 x .5 x 1 foot cage covered with bird droppings. A cage in a corner contained more than 20 parrots and several full-grown hens. Some parrots were hurting themselves by flying around in the 3 x 2 x 3 foot cage. Fantail pigeons were crammed in a cage that only had space to fit their bodies. The owner mentioned that a pair of java sparrows was Rs 3,000. A pigeon was worth Rs. 3,200 while a parrot could be bought for Rs. 2,500, he said, explaining that he purchased the birds from a breeder who imports birds and animals. The next shop had sparrows: there were two species, black-throated munia (Lonchura kelaarti) and scaly-breasted munia (Lonchura puntulata).We saw dead birds lying inside cages as well as stressed birds plucking out their own feathers. The owner said he sells a pair of sparrows for Rs. 1,000 and that 10 birds could be easily kept in a 1 x 1 x 1 cage. The sparrows were wild-caught birds sent from Polonnaruwa. Nearby were small rabbits for sale, crammed in a small cage, while an older rabbit that had a mangled coat was kept with a fighting rooster. We saw the shop owner fastening a clay water pot to the outside of a cage of hens. The hens were forced to drink by putting their heads through gaps in the mesh, and most got their heads stuck in the mesh. Animal Welfare Trust Chair Irangani de Silva said environmentalists and animal welfare activists plan to call upon Prime Minster Ranil Wickremesinghe to pass an animal welfare bill to save these creatures from misery and to regulate pet shops. She said activists had requested previous governments for action and even presented a draft bill to President Maithripala Sirisena’s secretary during the time of the 100-day program but the uncertain political background had prevented action. “Thereafter the bill was given to the Livestock Minister but with the urgency to pass the 19th Amendment the bill was not passed,” she explained. Animal rights activist Lalani Perera, a lawyer, said current laws allowed police, local government officials and the wildlife department to take action against animal cruelty. “The police are just not interested in prosecuting persons who break the law,” Mrs. Perera said. “Legally, they have power to take action against perpetrators.” She said any police officer, not just a member of the Police Environmental Unit, could take action. Mrs. Perera said under the Prevention of Cruelty to Animal Ordinance, enacted more than a century ago, the punishment for animal cruelty had not changed, and pointed out that a fine of Rs. 100 and a three-month jail term for cruelty was inadequate by current standards. 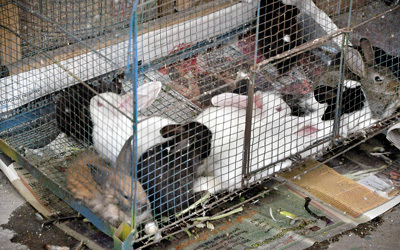 “I see a lack of regulations on animal cruelty and even though there are laws they are hardly ever implemented,” she said.The Secretary of the Animal Protection Trust, Chamini Ratnayake, said pet shops cared little for animal welfare. “I am not against pet shops but am against the way they commercialise the lives of animals,” she said. “They run their business inhumanely. They keep birds, fish and dogs and cats in cages and tanks out in the street. I wonder whether they even think that the animals are burning in the sun, that the fish being half-boiled and the birds being dehydrated,” she said. “I’ve witnessed large numbers of birds crammed in a cage that resembles nothing like their own habitat. I’ve seen multiple kinds of birds in the same cage with some killing each other due to lack of space as well as prey and predator response,” Mrs. Ratnayake said. The founder and Director of Embark, Otara Gunawardene, said the breeding and raising of rare animals as pets has become fashionable but people could live fashionably without this. “Animals deserve to live with their families as we do. They are not entertainment devices or status symbols. We should not satisfy our ego by hurting them,” she said. Ms. Gunawardene said most pedigreed dogs were inbred as well as suffering mistreatment in pet shops. The combination of these factors caused the animals to suffer physical defects as well as mental disorientation. CMC Chief Veterinary Surgeon Dr. Vipula Dharmawardene said according to the CMC ordinance the area local authority should licence pet shops. He said none of the pet shops operating within Colombo had a licence from the municipal council due to the fact that none of the shop owners provided even minimum facilities for animals. “As a veterinary surgeon I cannot approve any pet shop because most do not provide sufficient food, water, fresh air and space,” he said.Animals in pet shops had bacterial infections and mental disorders because of the horrid experiences to which they are subjected, he said. He claimed the CMC lacked legal authority to close down pet shops. Dr. Dharmawardene also pointed out that pet shops that were kept unclean spread disease to both animals and humans. A high-ranking official of the Environmental Police said that according to the Fauna and Flora Ordinance and other laws police could tackle animal cruelty but to make action effective the police, Customs, local government, Department of Wildlife Conservation (DWC) and the zoological gardens authority must all join in a combined offensive. DWC Director-General H.D. Ratnayake said it was prohibited for local animals to be sold as pets but local parrots and many types of local finches were mixed with foreign birds and sold. There are many invasive creatures brought in from other countries that were allowed to enter the wild as a result of an unregulated pet industry. They became a threat to endemic species, he said; some hybrids brought genetic diseases to the local fauna population. “If we find anyone selling or exhibiting without a permit, any endemic bird, fish, reptile or mammal removed from their habitat we will take legal action against the person who keeps them,” Mr. Ratnayake said.